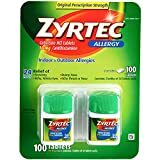 Zyrtec provides effective 24-hour relief from your worst allergy symptoms like sneezing, runny nose, itchy eyes, throat or nose. For temporary relief of symptoms due to: hay fever,other upper respiratory allergies, including runny nose,itching of the nose or throat, sneezing or itchy, watery eyes due to indoor/outdoor allergies. Price will be reduced to $29.69 with instant savings and optional subscribe & save discount.